Eli and me: How do you turn this thing on? Me: If you were a whale what would you eat for breakfast? Me: Lucky whale! What else?. Originally, I thought the concept came from some articles I read about Visual Thinking Strategies, but this is only partially true. I recently realized that, actually this concept may have taken root in my mind many, many moons ago in acting 101 class in high school. My rusty ol’ brain somehow managed to overlook this ancient knowledge until recently when my husband and I were roadtripping to Boston for a wedding. We decided to listen to Bossypants by Tina Fey. If you haven’t listened to and/or read it, I highly recommend you pick up a copy. First of all, it’s a hilarious, fast-paced read. But tucked in between the memories of bad teen haircuts and breastfeeding horror stories is an insightful, versatile approach to creative collaboration. In her chapter, “Rules of Improvisation That Will Change Your Life and Reduce Belly Fat”, Fey asserts that the fundamental rules of comedy improv work almost any creative setting. As I was listening to the audiobook, I realized how ideal this approach is for an early learning setting. Unless you are a total madman, then this concept probably seems a little risky, perhaps scary, and maybe even like a total nightmare. Improv is a little bit of all of these things, but there is method in this madness. There are rules. Say “Yes”. Agree, be open-minded to what your partner has created. Say “Yes, AND“. It’s not enough to just nod along, you need to contribute. In this interview at Google, Fey said it very eloquently, “An idea that you stumble on together is likely to be more interesting.” I just think this is such an awesome thing to say. There are no mistakes. Learning is a lifelong process, and mistakes are an important part of that process. When it comes to improv performance, many of the funniest moments are happy accidents. In my experience this it true for storytime, too. Not every attempt will accomplish the original goal, but we might learn important lessons along the way. This is especially important for young kids because it encourages persistence. 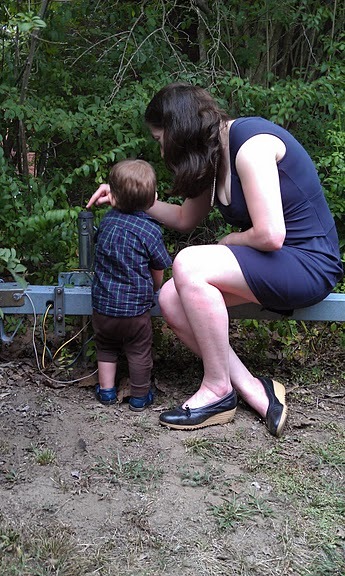 My friends Jen and Matt have an 18 month-old son. He’s awesome. Recently he has developed an intense interest in lights. He loves watching them go on and then off. Everywhere he goes, he gravitates towards lamps, light fixtures, candles, buttons that light up, etc, and makes the baby sign for “on” and “off”. Instead, I sat and watched for a while. Then I started talking about the things he was trying, “oh, that looks like a button, doesn’t it? I bet that will work” nothing happens, “What else can we try?” We worked like that for a little while, I mostly followed his lead. He tried pushing everything that looked like a button. He tried using my finger to push the buttons. Then I noticed there was a hole in tube, and it gave me an idea. I asked “what if we blow on it?” We blew on it. No light turns on, but it made this weird sound, and Eli’s eyes bugged out. I said, “I think that did something! Try pushing the buttons again!” This time when he pushed the various “buttons” I made a sound. He LOVED it! He started pushing buttons like a mad man, and I did my best to keep track of which sound when with which button. We had the best time! After this game, we ran all over the property (it was an outside wedding) exploring every little nook and cranny we could find. His mommy got a much-needed break; and Eli and I had a ball. When I got back, I wanted to see if I could find anything in the early literacy literature to support some of these ideas that have been jangling around in my head. I started in the parenting collection in my department, and picked up a copy of The Power of Play: How Spontaneous, Imaginative Activities Lead to Happier, Healthier Children by David Elkind in our children’s department. The parallels blew my mind. Thinking of Eli (my little buddy with the boat hitch), and our perambulations during the wedding seemed to jibe with Elkind’s ideas. Back in June, I wrote this post about saying “yes” in storytime. If I have learned anything in my experience as a children’s librarian, it’s that saying “No” or “You’re wrong” will shut down even the most eager young learner. From now on, whether I’m in storytime, at the reference desk, babysitting, or (in the future) parenting I want these rules inform my interactions with kids. I think with this is a great way to support and encourage lifelong learning from an early age.